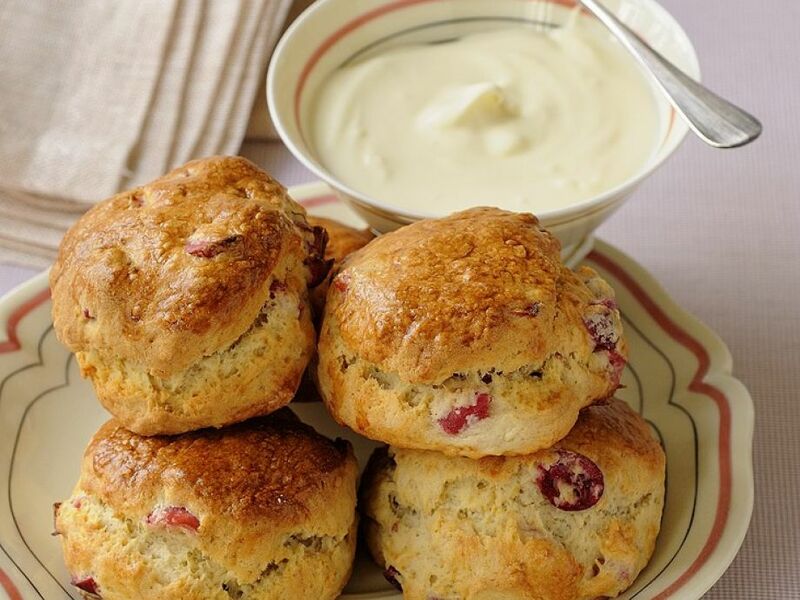 Cranberries Scones - Crisp and fruity: To start the day! 1 Knead the flour with the baking powder, sugar, salt, butter and yogurt. Add the cranberries. 2 On a floured work surface, roll the dough out about 2 cm (approximately 3/4 inch) thick. Cut out circles about 5 cm in diameter (approximately 2 inches). 3 Place the scones on a baking sheet lined with parchment paper. Separate the eggs (discard the whites or use elsewhere). Combine the egg yolk with 1 tablespoon of water and brush onto the scones. 4 Bake in a preheated oven at 225°C (approximately 440°F) (fan 200°C (approximately 400°F); gas mark 3-4) for about 15 minutes until golden brown.